Xmas window shopping is tiring work leh.. Walk walk walk and walk..
Really have to have something nice to eat to replenish the evaporated fat*hehehe*. 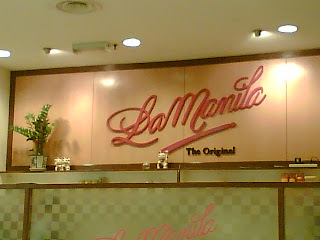 The thought of curry noodles at La Manila Midvalley makes my saliva drips. The first time when I ordered curry noodle at La Manila, I didn't expect much. Usually the curry noodles at food courts or at shopping outlets are nothing to shout about. This outlet is located on the 3rd floor of Midvalley, near the cinema. Just one shoplot but offer quite a large variety of food. Recently they even have "Koon Poh Chicken Rice". My friend ordered that and it comes with large portion of chicken. 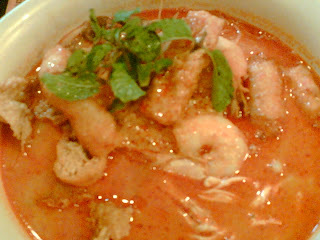 A big bowl of Curry Laksa with lot of "liu". Chicken slices, tau pok, fu chuk, prawns, fish paste, and cockles. A bit pricey at RM9/bowl, but what the heck!. We are in a shopping mall with air-conditioning, Xmas songs on air, comfy chairs and good enviroment for chit-chats. The little bit extra is worth it. 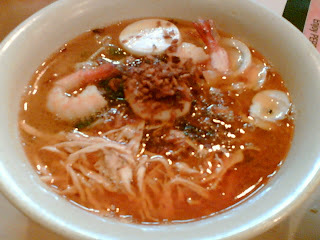 Another friend ordered Prawn Noodle. Also RM9/bowl. I had that before. The taste was also good and worth the money. There are prawn(a must duh! ), egg, chicken slices, Kangkung and friend onion. The soup...hmmm..good. Not too salty.